Do you like Gwent? Did you buy The Witcher 3's Hearts of Stone and upcoming Blood & Wine expansions? Do you really, really like Gwent, perhaps enough to bring it into the physical world so you can make your non-Witcher-fan friends play it with you? You'd better get moving then: CD Projekt Red is still selling two bundles of physical Gwent decks for $9.99 each to people who bought the expansions, but only until June 10. On offer are the Scoia'tael and Monster decks for Hearts of Stone owners and the Nilfgaard and Northern Realms decks for Blood & Wine buyers (obviously you can get both if you bought the season pass). These are the same decks sold with each expansion's Limited Edition boxed run, so you don't need to worry about picking them up again if you already bought those. 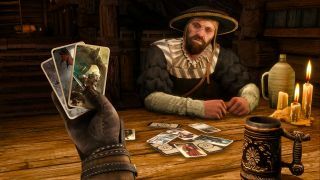 CD Projekt Red has made it clear that Blood & Wine is the last new content for The Witcher 3, and there are only four Gwent decks in the game, so chances are we won't see any more after this.